The only newspaper in the world to be written by hand, The Musalman is a legacy in more ways than one. The production process in this press is different from others around the world. 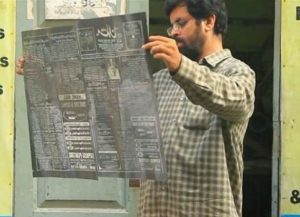 While designers in publishing houses can be seen working on different layout software, clicking their way to create grids and symmetries, this newspaper from the south Indian city of Chennai, works in what is perhaps the most unconventional and unique way. At The Musalman, a newspaper established in 1927, things haven’t changed much. It was incepted as a voice of Muslims, covering various international and national subjects, and it continues to do so, in the same fashion. Work on the newspaper begins at 10:00 am every morning. The articles are in by this hour. Two translators come in and redraft the pieces in Urdu. Next come in the three calligraphers, or the katibs, who with special nibs ink the broadsheets. The process takes about two hours. Post scripting, advertisements are added and the paper is then sent to be developed into a negative and for printing finally at around 01:00 pm. There are about 21,000 readers of this newspaper, who get their copy every evening for a few pennies. The Musalman costs INR 75 paise, which is less than a one Indian rupee, making it the cheapest newspaper in the country. Aged 91, it functions out of a rather small office and at the hands of a team who are all family or something like that. The Musalman is now edited and managed by Syed Arifullah, who is third in the family to be running the newspaper. The daily was started in 1927 by Arifullah’s grandfather Syed Azathulla, who had eventually given the hold to his son Syed Fazlullah. Talking of the family affair that is The Musalman, there are people here who have been around for nearly 30 years, having hired by Syed Fazlullah, and are now just like a family. “My father conducted calligraphy tests, analysed their handwriting, and hired them. They have remained with us all these years — we’re like a family,” Arifullah told a leading English daily. Calligraphy is rather crucial to the newspaper. It is in fact one of its USP, and Arifullah values his team much, for they are like his family but also a rare set of people. If Arifullah goes out seeking calligraphers now, it might be more challenging than one can imagine. There are not many institutes in the country that offer courses in Urdu calligraphy. There was a time when katibs were employed in various newspapers and publishing houses across the country, but that changed with the advent of technology, hence drawing people away from learning the skill and eventually shutting down of schools due to no takers. The Musalman is thus a legacy, in more ways than one. While it brings to its readers news, which is printed in a beautiful style, it is also known for disseminating the words of the holy Quran, and Islamic history. A four pager, it has its front page dedicated to top stories with a focus on international news. Page two has the editorial, and the other two pages carry local news and advertisements. It is the Monday edition that is different, which speaks of the holy saying and other cultural material. The newspaper does not carry any bylines and does more analytical pieces than short news reports, just like The Economist. “We don’t carry breaking news. It’s very difficult to rewrite entire pages, so we stopped,” Arifullah has been quoted saying. The Musalman has readers across the country, who are not necessarily Muslims, but Urdu readers. The newspapers are couriered to subscribers in cities like Kolkata and Delhi , making the process “very personal”. The newspaper is not online and does not intend to be in order to keep its unique status and legacy alive.